Path = "Copy " ++ Counter ++ " name(s) to clipboard"
What = "default - Full Path"
Path = Path ++ "\"
Path = file.folder(Str) ++ "\"
After developing the ClipFileList script and using it for a certain time I have noticed that it is not enough to satisfy my requirements in all cases when I need to copy file name(s) to the clipboard. While the ClipFileList script is good for "standard", "typical" copy operations, everybody needs to perform special, ad hoc actions. For example, sometimes I need to copy file name(s) with different path depths. It is not suitable to create separate buttons (or hotkeys) to copy file names with path depth of 2, 3, 4, and so on. Thus, it is required to have script able to select the path depth depending on the user's choice. Everybody has his/her own personal, specific requirements to the "file name to clip" copy operations. They can be roughly divided into "frequent" and "all others". While the ClipFileList script is good for the former group, the present script can cover all other cases. To copy single file name to the clipboard, just put the cursor on it and run the script. To perform the same copy operation for several files, first select them. The "What to copy" dropdown list contains the same choices that the ClipFileList script does for the second parameter, but presented in more readable way. 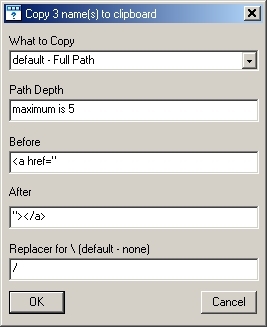 The "Path Depth" edit box initially contains the maximum path depth of the last file selected. This number is a prompt or a guide rather than limit or requirement. If the number entered by used exceeds the maximum path depth of some file, then the full path will be copied. Moreover, if files selected have different paths (for instance, they are taken from the listbox panel after search), the "Path Depth" value is of no importance. Edit boxes "Before" and "After" are initially empty and correspond to the 5th and 6th parameters of the ClipFileList script. The difference is that here there is no restriction to the use of quotes in these strings. The said is demonstrated by text shown on the screenshot. The last edit box can contain any character or string replacing the backslash character (usually forward slash). By the way, the "List To Clipboard" utility has no dialog function at all!